“SUPERPORE” was developed by applying “Triple pore structure” of APACERAM Type-AX to absorbable tricalcium phosphate ceramics. Clinical studies has shown excellent bone regeneration and balanced absorption of SUPERPORE and bone tissue replacement. 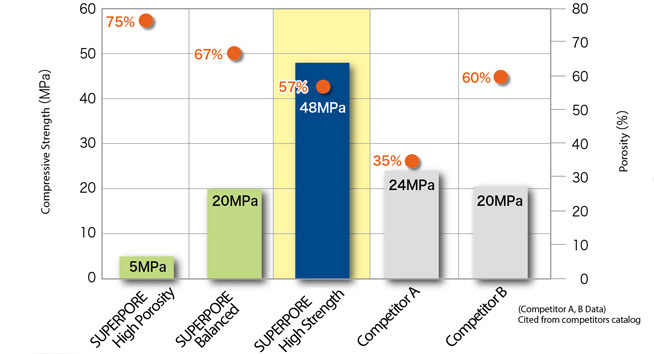 Three types of products with various porosity (75 – 57%) and strength (compressive strength: 5-48 MPa) are available depending on applying position and intended use. Blocks and granules are available for each type. 1. Triple pore structure developed using our unique technologies. SUPERPORE promotes early bone regeneration and remedy of bone tissue into its pores. SUPERPORE makes the most of the property of high purity β-tricalcium phosphate to be replaced to autologous bone. Uniform macro pore structure of approximately 200μm prevents breakage of the material. SUPERPORE has triple pore structure that is suitable for bone regeneration as illustrated in APACERAM Type-AX. 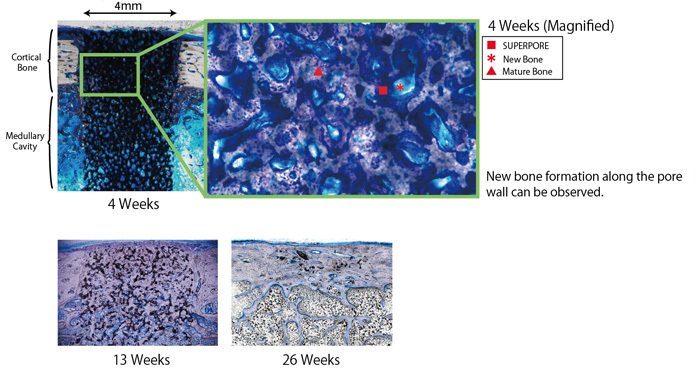 New bone formation and absorption of material were observed in 4 weeks after implantation. Maturation of the new bone was observed in 8 weeks. Further maturation progressed in 13 weeks and the material was almost absorbed in 26 weeks. In 4 weeks after implantation, new bone formation and expansion of the pores were observed. Absorption of the material progressed in 8 weeks and bone marrow tissue was clearly observed in 13 weeks. The material was almost completely absorbed in 26 weeks. As a result, regeneration of the bone was achieved in both cortical bone and medullary cavity including anatomical shape. Granules, blocks, and cylinder models are available. Balance type has characteristics with boneabsorption of the material and bone replacement due to its high porosity (67%) consisting moderate strength (compressive strength: 20MPa). SUPERPORE balanced type blocks (porosity 67%, Ø4mm x 12mmL) were implanted in the femurs of canines and extracted in 4 and 13 weeks. Samples stained by toluidine blue were prepared for observation. Implantation tests were executed in accordance to ISO10993 in the facility of GLP level. Active bone formation was observed around the material in 4 weeks. Early stage of the bone formation was observed in the pores whileabsorption of the SUPERPORE (Balanced type) l and replacement of new bone tissues were observed immediately below the periosteum and at the interface of the medullary cavity. In 13 weeks, bone formation continuing the host bone and absorption of the material were observed in the cortical area, while medullary cavity and adipose tissues were formed in the medullary cavity area. Granules, blocks, cylinder and wedge models are available. High strength type is characterized by high mechanical strength (compressive strength: 48MPa) and triple pore structure that is suitable for fast bone formation. 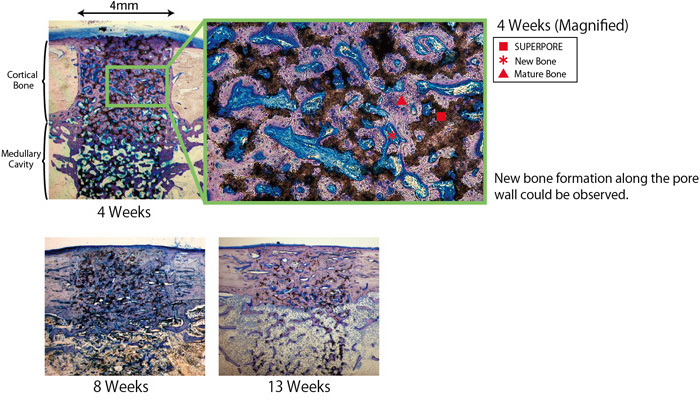 SUPERPORE high strength type blocks (porosity 57%, Ø4mm x 12mmL) were implanted in the femurs of the beagles and extracted in 26 and 52 weeks. Undecalcified samples stained by Hematoxylin and Eosin were prepared for observation. Implantation test was executed in accordance to ISO10993 in the facility of GLP level. 26 weeks after implantation：Bone formation continuing to host bone and absorption of the material and replacement by bone were observed in the cortical area. 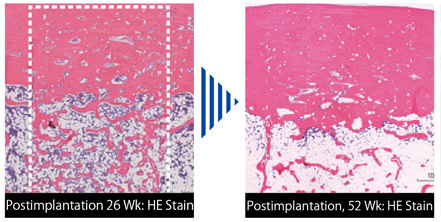 52 weeks after implantation: The material was almost absorbed and replaced by bone. Bone regeneration was observed allover the implantation area including anatomical form.